Left and center necklaces are Yemaya's traditional glass beaded necklaces. 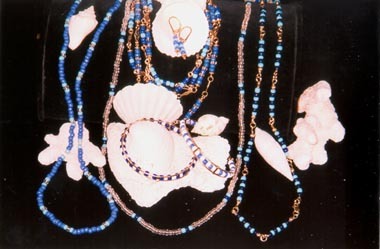 On the right a 14k gold glass beaded Yemaya necklace. On the bottom are two 14k gold bangles. Above is a cluster of 14k gold glass beaded necklaces with a pair of 14k gold earrings in the shell.